The challenge of every webmaster or website owner is ranking it on search engines, and especially on the first page, in order to generate traffic which will allow it to make its objectives (sell, be known, be contacted, etc.). The first thing to do before setting up a relevant SEO strategy, is to make a precise assessment of the current ranking of your website. The idea is to know exactly which are the keywords on which you are positioned, and on which page of Google your website is already ranked. This is so you can ask yourself the right questions, and define a list of keywords or complementary strategic expressions on which you want to position yourself in search engines, according to the quality and quantity of potential traffic generated by them. It is important to note that its position affects optimal prioritisation. So, it may be easier to move from position 18 (on the second page) to the first page, rather than being ranked on a keyword which does not appear in the first 10 pages of Google. Analysing positions and traffic allows you to measure the impact of SEO efforts, identify strengths, and weaknesses, but especially effective solutions which optimise SEO. A technical update or content on your website, new links (backlinks) or simply an update of Google’s algorithm may be the cause of a rise. It is necessary to measure it to be able to analyse it. 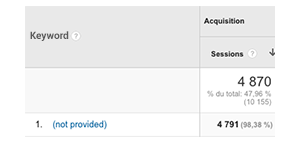 Everything changes very quickly on SERP (results pages) so you have to be vigilant. If some descents are progressive, others can be very brutal. This is why regular monitoring, and establishment of alerts, are essential. 3- Have I been punished by Google (or did I make a mistake)? An algorithm sanction is a penalty given when Google feels that you don’t respect its instructions for webmasters. The sanction can be immediate, as soon as your page has been visited by a Googlebot. A minor penalty, concerning one or more keywords. A major penalty, impacting the entire website. Which means it is no longer visible on the keywords on which it was ranked. The best way to spot a possible penalty is to analyse the website’s positions and traffic. In the error category, there are also technical errors or redesigns which can cause important falls in ranking. Forgot robots.txt? No index on your pages? Access behind an htaccess? The list is long. That’s why, in addition to tools for onsite analysis, it is important to follow its keywords’ positions. 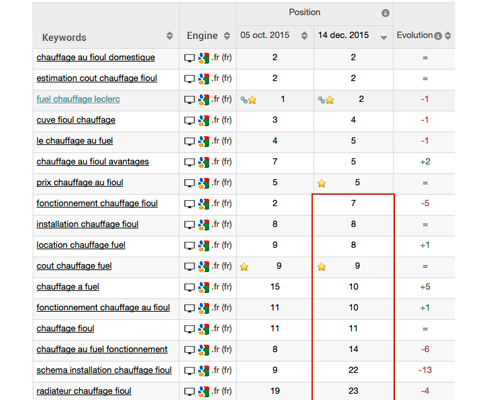 Tracking the top 10 keywords positions, and change of position, further to a robot.txt. We talked about this in another article on the not provided, and the method which myposeo uses to estimate generated traffic by the ranking of each of your keywords. Rank tracking allows you to detect traffic generated by a keyword. Search volume tracking and its variation for your keywords is also very important. For example, for the fioulmarket.fr website: the estimated traffic increases steeply. The answer is due to the fact of the seasonality of a tracking keyword, whose traffic estimate indicates a large growth because of an increase in search volume in October and November. A well ranked keyword is not an end in itself. It is necessary to associate it with the traffic that it brings, to see if it meets the concrete objectives (conversions, sales etc.). However, tracking your ranking in search results will allow you to observe the evolution of your visibility and daily work on its evolution while helping you make better decisions. If you are not already a user of the myposeo tool, why not think about testing it free. Your competitors already like our tool!